<b>Publisher's Note: Products purchased from Third Party sellers are not guaranteed by the publisher for quality, &nbsp; &nbsp; &nbsp; authenticity, or access to any online entitlements included with the product.&nbsp;</b><b><br /></b><b><br /></b><b>Improve quality and economy of your manufactured product, at every state of manufacturing.</b><br />From raw materials ... to machining and casting ... to assembly and finishing, the Second Edition of this classic guide will introduce you to the principles and procedures of Design for Manufacturability (DFM)&Ntilde;the art of developing high-quality products for the lowest possible manufacturing cost. Written by over 70 experts in manufacturing and product design, this update features cutting-edge techniques for every stage of manufacturing&Ntilde;plus entirely new chapters on DFM for Electronics, DFX (Designing for all desirable attributes), DFM for Low-Quality Production, and Concurrent Engineering. From raw materials ... to machining and casting ... to assembly and finishing, the Second Edition of this classic guide will introduce you to the principles and procedures of Design for Manufacturability (DFM)Ñthe art of developing high-quality products for the lowest possible manufacturing cost. 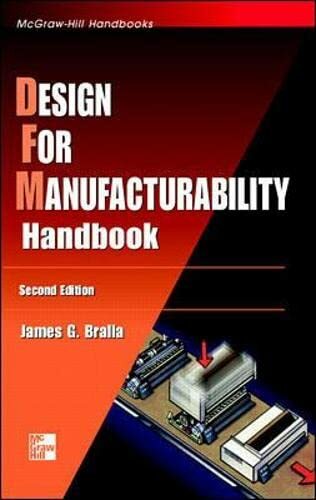 Written by over 70 experts in manufacturing and product design, this update features cutting-edge techniques for every stage of manufacturingÑplus entirely new chapters on DFM for Electronics, DFX (Designing for all desirable attributes), DFM for Low-Quality Production, and Concurrent Engineering.